Aluminum is characterized with properties such as high conductivity, ductility, and malleability. These properties have highly promoted the use of the metal in a number of end use industries, thus driving the global aluminum market. Aluminum is extensively used in the construction industry owing to its light weight and corrosion resistance. In addition to this, it is also used in electrical transmission lines as it acts as a good electrical conductor. This has resulted in an increased production of the metal, thereby propelling the aluminum market. Aluminum finds several applications in the transport and food industry. Consequently, an expansion of these industries has highly contributed to growth of global aluminum market. Moreover, technological advancements and urbanization have also led to an expansion in the aluminum market. As per expert analysts, the global aluminum market is projected to grow at a CAGR of 6.4% between 2017 and 2025. Growing at this rate, the market will be valued at US$249.29 bn by the end of 2025 from US$143.87 bn in 2016. 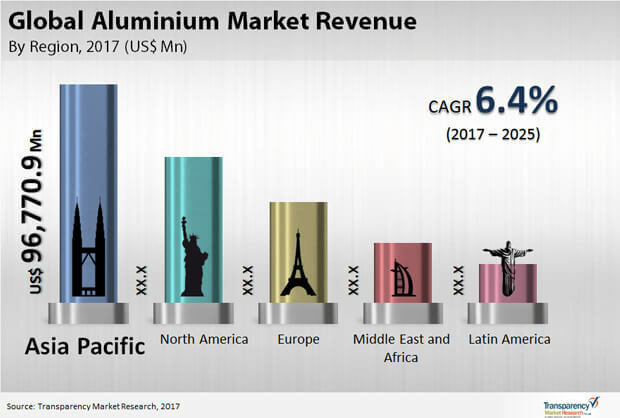 Ongoing technological advancements and growing awareness about the benefits of aluminum have increased the consumer base of the global aluminum market. The market is majorly bifurcated on the basis of types, products, end users, and geography. On the basis of type, the global aluminum market is segmented into pure aluminum and aluminum alloys. Aluminum alloys hold the highest revenue share in the market as they are extensively used in the construction industry. Moreover, aluminum exhibits high corrosion resistance and high strength when alloyed. In terms of products, the global aluminum market is divided into plates, sheets & foils, ingots, cables and wires, and others. Out of these products, ingots accounts for the highest revenue share in the market. Ingots are increasingly used in the automobile industry and have several electrical applications. In addition to this, they can be re-melted and processed into a number of products. These factors have highly contributed to the growth of this segment. On the basis of end users, the global aluminum market is segmented into transportation, electrical, construction, foils & packaging, and others. The transportation segment dominates the global aluminum market in terms of revenue. Aluminum helps in increasing the fuel efficiency of vehicles. This has led to an increasing adoption of the metal in the transportation industry. Geographically, the global aluminum market is bifurcated into North America, Asia Pacific, Europe, Latin America, and the Middle East and Africa. In 2016, Asia Pacific accounted for 60% of share in the global aluminum market. The region is further expected to lead during the forecast period. This growth can be attributed to a flourishing construction industry in this region. Moreover, rapid urbanization in developing economies such as India and China have propelled the market’s growth in Asia Pacific. China holds the highest revenue share in the aluminum market in this region. The market in Europe is driven mainly by Germany owing to A booming automobile industry in this region. Rapid industrialization has also contributed to the market’s growth in Europe. Prominent players in the global aluminum market include Alcola Corporation, Emirates Global Aluminum PJSC, Aluminum Corporation, RioTinto, Kaiser Aluminum Corporation of China Limited, and RUSAL.